Daring AP eats any DD alive until you angle. What's your point? I dont know where you attitude came from. Youre a crapbag. either angle against him to mitigate AP till he switches to HE, and you lose out either way in a direct 1v1 with kidds 3 guns that can fire angled. No attitude? I asked a question. I guess I was just confused because ‘Daring AP eats it alive’ comes across as a counterpoint to an argument that didn’t exist. Nowhere in this topic did I ever argue that the Kidd was better than the Daring. So it just seemed strange, and I was asking what your point was. if you were just stating an objective fact, then I agree. The Daring AP will absolutely eat the Kidd alive. Devil Dog, I found my U.S.S. Kidd a solid premium ship. She has heals that allows me to be aggressive in supporting BB and fellow DDs AA coverage. 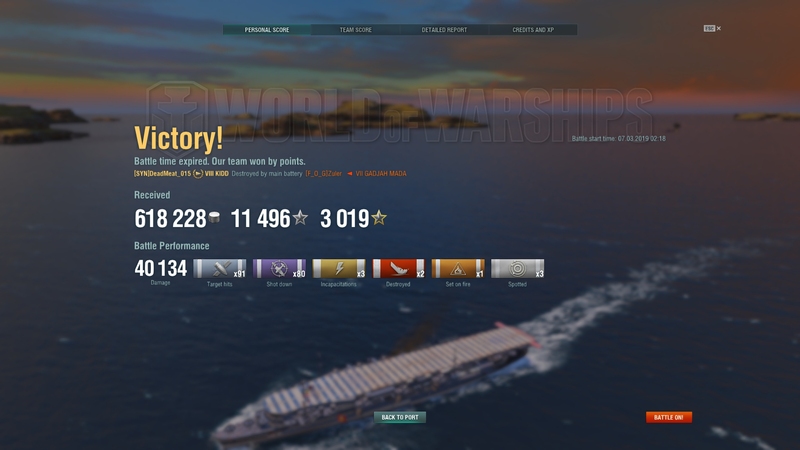 In on random match took on two enemy Lexington CV trying to destroy the tirpitz until I pressed my zap button (Def Fire). They then sent wave after wave trying to kill me. 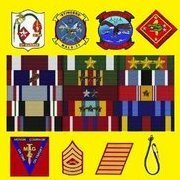 I recall they gave up after the 37th plane being shot down. 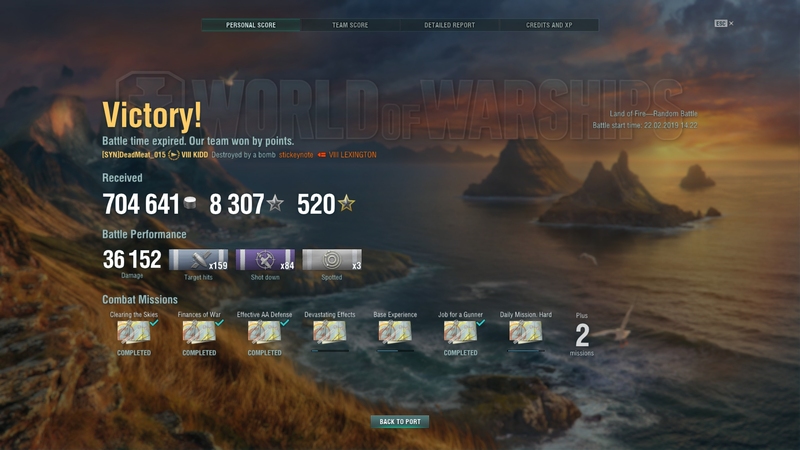 My only regret in owning the Kidd is I cannot join a division with tier 10s due to the +/- 1. 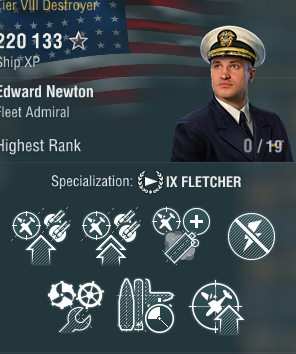 I have three 19-point Fletcher Captains that I rotate depending on what build I use. You and I pretty much have the same build but deffer in the captain skills. In the support role I use smoke to cover the fleet and AA. Contesting the caps is not the primary here. That’s a hell of an AA build. No wonder you’re shredding everything! I messed around with this build right after the rework dropped but I found myself really missing survivability expert and concealment. Now with CV population back to tolerable levels, running the one AA mod that replaces main battery accuracy, and BFT, I find it a good middle ground. The Kidd is a great example of a premium done right. It’s stayed competitive through everything thus far. The sector is re-enforced to 180% in like 4-5 seconds. The Atlanta used to be my goto ship when lots CVs around, but it is not the AA platform it was in the rework. The Kidd, IMO, was so much better as a pure gunboat and did not do AA as well as WG advertised prior to rework. But now? hehe I am tearing up CVs with the Kidd. I am not running AFT, I dont think it adds enough to justify it over IFHE. But I am running BFT, MFCAA, the ship module and the AA special module. It's those two (2) mid-range 40mm quads that erase planes from the sky that makes her. Since She has heals I can forego CE. I mainly use her to give BBs AA coverage like Yamato or low end AA ships. If war gaming offered a way to pay $$$ to move her up to tier IX I would do it without thinking about it. This would allow her that extra module slot for enhancing her AA to god tier.